Nepal is a country with a diverse society. The population is divided into caste groups, each of them having different cultural traditions, and economic status that will determine a person's opportunities and privileges. Children belonging to low castes live in unfavorable circumstances. Nepalese culture considers orphans unlucky, specifically girls. Located in Kathmandu, Nepal's capital and largest city, Lotus Children's Home is a small family-run orphanage that hopes to give children a better chance at life, no matter the caste they were born into. The home was co-founded in 2006 by husband and wife, Laxman and Laxmi Shresthas. Having lived in an orphanage herself as a child, this is a cause close to Laxmi's heart. With the proper knowledge and motivation, the Shresthas' are currently caring for nine children at the orphanage. The couple also has three kids of their own, but they consider all children as members of the family. Providing them a home, meals and a quality education, the couple hopes to also provide a more dignified future. Education is the biggest concern for the Lotus Home founders. That's why they send all twelve the kids to one of Kathmandu's best private schools. 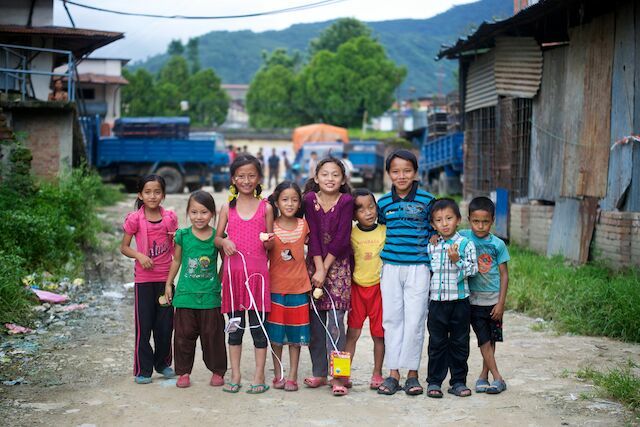 In Nepal, especially for those who are orphaned or otherwise vulnerable, having a good education is essential. Lotus Children Home accepts donations of any amount to help to pay for the children's education, as well as clothing, food and other basic needs. Those who provide a monthly contribution will have a sponsor child and will receive a periodic update about their lives. The home also welcomes volunteers who can share their knowledge and experiences with the children. In 2013, American photographer Rebecca Eby went to Nepal with Photographers Without Borders to document the work of Lotus Children's Home. For her, it was one of the most meaningful projects that she has ever been part of, inspiring a desire to help orphaned children around the world. While in Nepal, Rebecca wanted to explore as much of the country as she could, and have genuine experiences. A favourite memory of the trip was when she and the family travelled to a big annual festival. "I experienced hospitality from local families and stayed in a traditional rural home, sprained my ankle on moss-covered stone steps, and learned so much about their culture," Eby said. "There were very few tourists at this festival and learning their customs was fascinating." To know more about Lotus Children's Home please click here.